Tomb keeper Madam Queenie Quek tending to a grave in Bukit Brown Cemetery. During Qing Ming, paper offerings are burnt for the ancestors. Here, the offerings symbolise money to be used in the afterlife. Qing Ming Festival (清明节) is a traditional Chinese festival for the worshipping of ancestors, usually occurring on the fourth to sixth day of April of the Gregorian calendar and the early part of the third lunar month in the lunar calendar. The lunar calendar divides the year into 24 solar terms, and Qing Ming takes place at the start of the fifth solar term, marking a change from winter to spring. During the festival, the Chinese would visit cemeteries and columbaria to honour deceased family members at their graves or urns, as an expression of filial piety. Visits to the cemeteries and columbaria can take place either on the actual day of Qing Ming or 10 days before or after the actual day. Qing Ming, translated as “clear” (qing, 清) and “bright” (ming, 明) makes reference to spring time in China, where people would leave their homes to “sweep the graves” (sao mu, 扫墓) of their ancestors. Qing Ming is practised in China, believed to have been a tradition since the Tang Dynasty. In Singapore, the custom was introduced during the 19th century when Chinese migrants arrived and set up their respective burial grounds based on dialect groups, where the practices of ancestral worship take place. 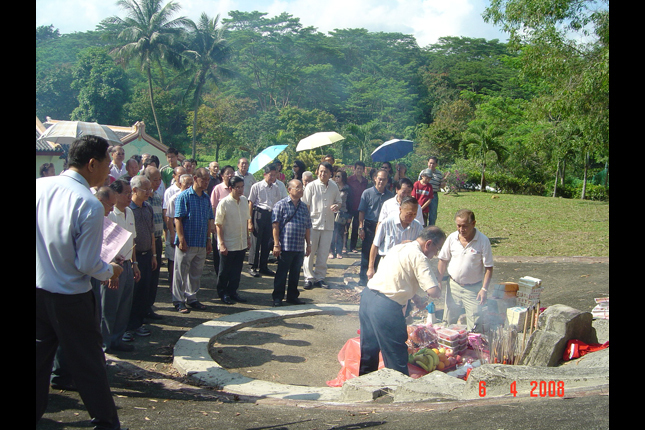 Ancestral worship during Qing Ming in Singapore may take place in cemeteries such as Bukit Brown Cemetery, Choa Chu Kang Cemetery, Shuang Long Shan Cemetery, also known as Ying Fo Fui Kun Hakka Cemetery, as well as at columbaria located across Singapore. Qing Ming is observed and practised by the Chinese community, including many local Chinese clan associations which organise ancestor worship for their members. There are also “tomb keepers” or “caretakers” who look after the graves. From as early as January, the tomb keepers may start clearing the grass and sprucing up graves under their care, leaving the finer tasks of painting and the touching of inscriptions nearer to Qing Ming Festival. Qing Ming begins with “sweeping the grave”, involving the upkeep and maintenance of an ancestor’s grave or urn. Inter-generational families may allocate half a day at their ancestors’ graves, with some bringing home-cooked food known to be deceased’s favourite food. Depending on the dialect group, descendants lay out offerings ranging from food, flowers, tea and huat kueh (prosperity cake), first for the Tu Di Gong (土地公, Earth God), then for wandering spirits. Rituals may include paying respects lighting red candles and holding lighted joss sticks while standing, bowing, or kneeling, before the burning paper offerings. These paper offerings include items symbolising money, bungalows, cars, and mobile phones—to be used by ancestors in the afterlife. At the end of the visit, the food offerings are brought home to be consumed by the family. Within the ethnic Chinese community observing Qing Ming, many local Chinese clan associations continue to organise ancestor worship for their members, through events like “spring prayer rites”. Some people may also make offerings to the deceased who are not related to them at all. At Bukit Brown Cemetery, caretaker Madam Queenie Quek observes that although the villages around the area were cleared in the 1980s, former villagers are still helping to maintain the unclaimed graves (such as those without descendants), in addition to the graves of their own families. Madam Quek and her family have inherited this role from her mother, and her grandmother before that. These villagers also help people locate forgotten graves of ancestors. An increasing challenge to the observance of Qing Ming in Singapore is land scarcity. The changing nature of Qing Ming is reflected in the growing number of columbaria, as cremation has become widely accepted over time, and the practice of visiting cemeteries during Qing Ming has been rapidly replaced with visits to columbaria and temples that house ancestral tablets. This has resulted in changes to the ancestral worship practices traditionally observed at cemeteries. Another challenge is the gradual loss of knowledge about Qing Ming rituals, such as the procedures of making offerings. The locations of ancestors’ graves may also be lost, particularly for those who passed away long ago. Funeral service directors have also observed a growing preference for cremated ashes to be scattered at sea or lowered in biodegradable urns into the waters. Despite these challenges, Qing Ming Festival continues to be widely observed by the Chinese community in Singapore and is likely to continue at the various cemeteries and columbaria, although the rituals will continue to evolve over time. For example, in order to cater to the busy lifestyles of Singaporeans, paper offerings packages can now be purchased online and collected before the visit to the cemetery and columbarium. In addition, clan associations and temples continue to serve as institutions that hold the knowledge for the rituals and practices of the festival. Comber, Leon. Through the bamboo window: Chinese life and culture in 1950s, Singapore and Malaya. Singapore: Talisman, Singapore Heritage Society, 2009. Khoo Boo Eng, “Qing Ming Festival”, A Simple Approach To Taoism: Festivals, Worship and Rituals. Singapore: Partridge, 2014. Lai, K. F. & Chin, K. O. “Chinese All Souls’ Day”. In Lai, Kuan Fook (ed), The Hennessy book of Chinese festivals. Kuala Lumpur: Heinemann Asia, 1984Loh Kah Seng. “History of the dead, heritage of the living: Bukit Brown Cemetery in Singapore”, Kyoto Review of Southeast Asia 12, September 2012. Ng, Kelly. “The guardians of Choa Chu Kang Cemetery”, Today, 21 July 2017. Singapore Federation of Chinese Clan Associations. Chinese customs and festivals in Singapore. Singapore Federation of Chinese Clan Associations, 1989. The Economist. “Brown study: a Singapore cemetery”, The Economist, 17 March 2012.
https://www.economist.com/node/21550321. Accessed 26 April 2018. Wong, C. S. “Homage to the ancestors”, An illustrated cycle of Chinese festivities in Malaysia and Singapore. Singapore: Jack Chia-MPH, 1987.